Learn about all about car battery life expectancy - How long it will last on the average and how to extend your battery life. Long standing times i.e. a car that is not driven for a couple weeks at a time, high temperatures which accelerate corrosion and discharging the battery accidentally by leaving the lights or another electrical device on... all contribute to the early retirement of your car battery. Temperature extremes are bad news for battery life - Batteries are more likely to die or go flat during very cold periods as it takes more effort to start the motor in low temperatures. More current will drawn from the car battery, therefore depleting it faster. On the other hand, hot weather will also lead to increased battery corrosion and degradation. Your pattern and habits affect battery life as well. 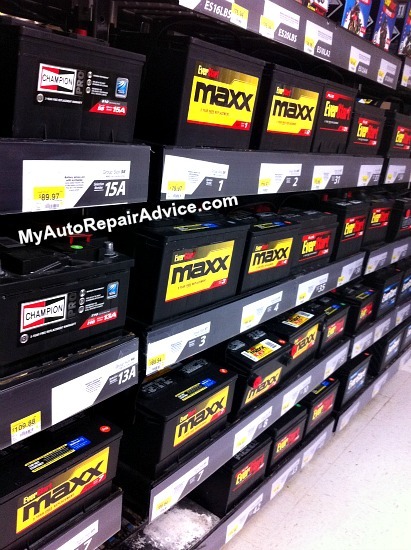 If you often make short trips, your car battery doesn't have the chance to recharge fully. This leads to an acid imbalance which will corrode the battery and shorten its lifespan. 1. Don't add new electrolyte (acid). 2. Don't use unregulated high output battery chargers to charge batteries. 3. Don't place your equipment and toys into storage without some type of device to keep the battery charged. 4. Don't disconnect battery cables while the engine is running (your battery acts as a filter). 5. Don't put off recharging batteries. Check your car owner's manual for the battery maintenance schedule. 6. Don't add tap water as it may contain minerals that will contaminate the electrolyte. Use only distilled water. 7. Don't discharge a battery any deeper than you possibly have to. 8. Don't let a battery get too hot to the touch or boil violently when charging. 9. Don't mix battery type and sizes.